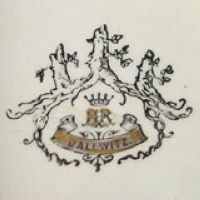 The history of this factory started in the year 1804 after Johann and Wenzl Ritter von Schönau decided to found a stoneware factory in Dallwitz. As they required a technical specialist they decided to take Benedikt Haßlacher as partner who at that time was still working for the stoneware factory in Prague. 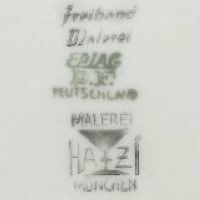 The partnership contract was signed on December 5th 1804 and Haßlacher became equal partner with one third of all shares and the position of technical director. On March 18th 1805 the company applied for a manufacturing concession which was (informally) granted by the Gubernium on October 17th 1805, a very quick decision - note that it in took until November 21st 1807 before the official paperwork was finally issued! Needless to say the factory itself had been finished previously and initial firings of the two hard coal fired kilns delivered perfect results. Winning Benedikt Haßlacher as partner and director for the company proved highly profitable as he turned the newly-founded business into an instant success, two years after its founding the factory already employed 64 workers and products had reached an extraordinary quality level, something that of course was not missed by important people. For example the famous German writer and polymath Johann Wolfgang von Goethe visited the factory six times between 1806 and 1820 during his studies of local minerals - a lesser known fact about Goethe is that he was also a mineralogist and offered his knowledge on local mineral deposits to various industries including porcelain factories. During his first visits at the factory Goethe noticed a certain dinner set which impressed him so much that he decided to purchase a complete set for twelve people as a present to his wife Christiane, his diary and various letters to her mention the set and the problems of actually receiving it as the factory apparently went through a period in which it had various problems with the mass itself and actual glazing, causing many firings to end in failure. Benedikt Haßlacher during his time as director of the Dallwitz factory never really stopped looking for opportunities, for example he was between 1812 and 1814 active as partner of Franz Mießl who owned the Steingutfabrik Schlaggenwald (which later became the Porzellanfabrik Haas & Czjzek A.G.). His position there did not influence his work for the Dallwitz factory but his partners were still slightly put off, trying to convince Haßlacher that his only position should be in Dallwitz. Haßlacher however knew exactly what he wanted and after his partners tried to further increase pressure did what they had least expected - he quit, instantly throwing all his energy into a new project and in 1818 finally founding his own factory in Altrohlau (where he was later also visited by Goethe). After Haßlacher left, the brothers Johann and Wenzl went through endless discussions and a massive dispute after which Wenzl also left, leaving Johann Ritter von Schönau as sole proprietor between 1914 and 1921. He more or less successfully concentrated on holding former production standards and retired shortly before his death in 1921, leaving the company in the hands of his son Wolfgang Julius Ritter von Schönau. Wolfgang during his time experimented with various receipes for improved stoneware masses and in the end decided to rather concentrate on porcelain production, receiving a porcelain factory concession from the Gubernium on December 9th 1830. 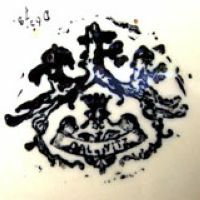 His initial trials were a success and after a short period of testing various porcelain decoration methods he asked for a permit to install a copperplate printing press which was granted on March 9th 1831 (printing as such was a matter of the book printing guild and required their consent). Even though the factory was running pretty well and all experiments were successful, Wolfgang sold the factory to the former farm owner Wilhelm Wenzel Lorenz. One of the first steps taken by Wilhelm Lorenz as new owner was a complete modernization of the factory and in 1844 (the year his factory employed 100 workers), he applied for permission to install a copperplate printing press, which was nearly instantly granted. Unlike the official manufacturing concession by the way - it took the local authorities ages to get the paperwork sorted out and the factory actually worked semi-legal until the concession finally turned up on February 20th 1845. Wilhelm Wenzl Lorenz in 1850 sold the factory to the accountant Franz Fischer and the factory (which employed around 100 people at that time) continued to produce nearly the same range of products including luxury goods, tea- and coffee sets, plates, bowls and dishes, vases and a small number of figures as well as doll house items. Fischer as former accountant had no idea when it came to design and the original designs he had inherited with the factory were slowly becoming obsolete, hence he required the aid of a specialist or otherwise capable business partner like the businessman Franz Urfuß who joined the company as partner in 1855. The factory was renamed accordingly, however soon afterwards the two started to argue about the product range (which by now also included Rococo Revival pieces) and funding until Fischer finally gave up and retired, selling the factory to Urfuß. Urfuß might have been the experienced one of the two former partners but nearly all of his money went to Fischer as payment for the factory, forcing Urfuß to take in his wife Julie for partner as she came from a wealthy family which at first helped out with a little capital. The family however soon dropped support as Urfuß did not want the family influence to take overhand and strictly stuck with his ideas on how to run the business. Without financial backing however he was in the end forced to turn over control of the factory to his main creditor, the Thüringer Bank (the largest Thuringian savings banks at that time). The bank in turn installed him as factory manager, which of course meant that he required permission for every single step he took - a position in which Urfuß probably often thought that the influence he denied the family of his wife might have been the better option. The Thüringer Bank of course was in the long run more interested in actually selling the factory and recovering its investments, finally succeeding in 1871 after being approached by the brothers David and Friedrich Riedl von Riedelstein. Some sources claim that the new owner was merely named Riedel von Riedelstein, probably assuming that Riedel was a first name. That is incorrect in meaning and spelling as the name (correct: Riedl von Riedelstein) is a combination of the Riedl family name and the honorary title of von Riedelstein: Johann Baptist Riedl (*1801, †1858) from the west Bohemian town of Kraslitz (Czech 'Kraslice') in 1854 was rewarded with the title of nobility and received the honorary title of von Riedelstein. Of course all resulting combinations, like the use of the title Baron Riedl von Riedelstein, should be read as exactly that - it is a title and not a personal name, something that is very often lost in translation. 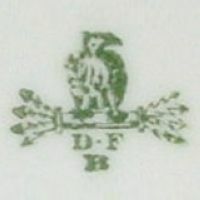 The brothers David and Friedrich drastically changed the product range and by the year 1883 it consisted of various porcelain dinner, coffee and tea sets both in standard or luxury versions as well as stoneware wash basin sets and normal tableware with lead-free glaze as well as many decorational majolica items based on various genres. It was in the same year that David retired from business, leaving the factory in the hands of Friedrich who continued business alone until he retired in 1889. As a side note it should be menitoned here that Friedrich Riedl von Riedelstein already in 1872 purchased the Dallwitz estate and had it replaced by a chateau in pseudo Renaissance style which later housed an impressive and internationally renown collection of old scripts. Friedrich Riedl von Riedelstein sold the factory to Springer & Co., owner of the porcelain factory in Elbogen, which installed Ludwig Pröscholdt as director who concentrated on porcelain production and gradually discontinued the work on stoneware and majolica. 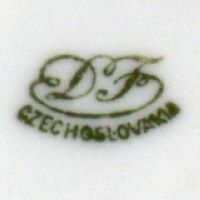 Pröscholdt in 1891 together with the shareholders Rudolf Gottl and D. Zebisch purchased the factory from Springer & Co. and despite the misleading company name the factory actually only produced porcelain, re-activating the well-known basic 'DF' mark originally used by David and Friedrich Riedl von Riedelstein. The already mentioned shareholders were later joined by Pfeiffer as well as Mrs. Pauline Köstler and business itself flourished; around 1904 the factory employed around 500 people. It should be mentioned here that the shareholders involved were also active in other areas: Rudolf Gottl as well as the company of Zebisch & Pfeiffer owned and exploited their own kaolin deposits; these small companies for raw materials together with that of Jacob Lorenz (descendant of Wilhelm Wenzel Lorenz) were before 1912 all taken over by the ⇒Zettlitzer Kaolinwerke in Zettlitz. 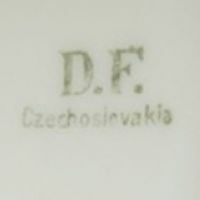 During the last years the market for Bohemain porcelain had slowly changed and business was slowly declining at all factories of the region. 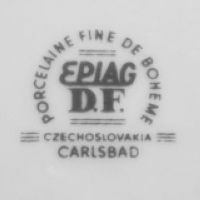 Based on an idea from 1917 the company was the first approached by a representative of the Austrian government and so got directly involved in the founding of the first association for porcelain promotion in Bohemia, the ⇒Österreichische Porzellan Industrie A.G. or 'ÖPIAG' for short. Following the successful establishment and first complete business year of the association the members eventually decided to rename it to reflect the changed political situation and as there were rumours of upcoming competition in form of the Porzellan-Union A.G. the board decided to make a point by renaming the business according to the fact that it had been the first of its kind (in Bohemia). Business boomed and in 1930 the factory employed around 400 workers, a number which remained stable until 1937. 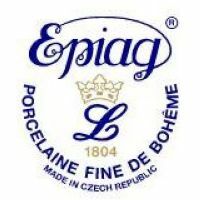 The whole EPIAG group was nationalized in 1945 and together with other factories became the Starorolský Porcelán group. 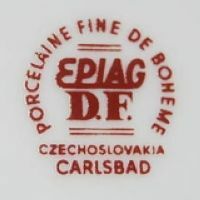 Due to the long tradition of the former privately owned Dallwitz factory in combination with its role during the OEPIAG/EPIAG period the name 'EPIAG' itself remained part of the factory name even after the creation of the Karlovarský Porcelán o.p. branch directorate in 1958. The years passed and the factory in Dallwitz often played an important role in the history of the Karlovarský Porcelán group, successfully representing the group on the national and international markets. But once again the political situation was changing completely and following the drastic changes in national and international politics which resulted in the breakup of the USSR and subsequently the whole Eastern Block, Czechoslovakia as state was getting ready for yet another great change. 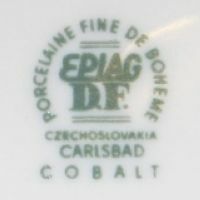 In 1992 finally, shortly after the porcelain factories in Jokes-Witwitz near Jakobsburg (Czech 'Jakubov') and Gießhübel (at first named 'Kysíbl', then 'Stružná') had been integrated into the state-owned Karlovarský Porcelán group, the general reprivatization process set in and all factories from the group were taken over by the transfer company EPIAG DAFA s.r.o. which in 1997 stopped production at the Dallwitz plant. 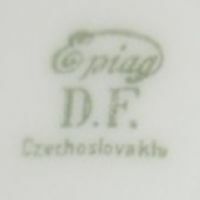 After a few years the former factory and all name and trademark rights were purchased by the Lofida Porcelán CZ s.r.o. 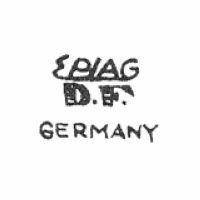 and business was reactivated under the famous EPIAG abbreviation. The company shortly afterwards already employed over 80 people and offered a comprehensive range of utility and exclusive chinaware products. Business was an instant success and already in the year 2009 the company was able to purchase the factory in Chodau (Czech 'Chodov'), a former subsidiary of 'Haas&Czjzek' from Schlaggenwald (Czech 'Slavkov'). 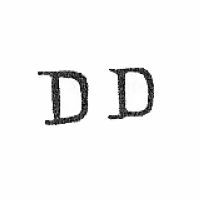 Used from around 1804, impressed letter pair 'D D'.  Used between 1832 and 1840, impressed 'DALWITZ'. Early version is written with one 'L'.  Used between 1840 and 1850, faintly impressed 'DALLWITZ', version with double 'L'. Used between 1840 and 1850, example of a 'hard' impression, version with double 'L'. Used between 1832 and 1850, impressed 'W. 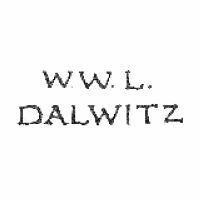 W. L.' above 'DALWITZ'. Used between 1832 and 1850, impressed 'W. 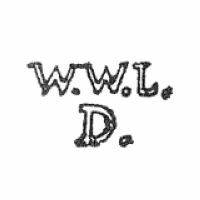 W. L.' above 'D'. 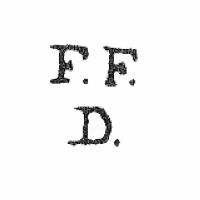 Used between 1850 and 1855, impressed 'F F' above 'D'. 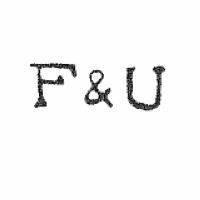 Used between 1855 and 1860, impressed 'F & U'. 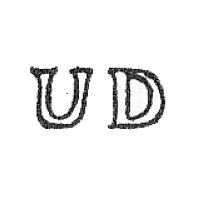 Used from 1860 onwards, impressed letter pair 'U D'. 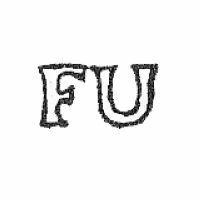 Used between 1860 and 1871, impressed letter pair 'F U'. 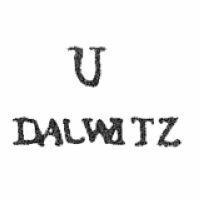 Used between 1860 and 1871, impressed, 'U' above 'DALLWITZ'. 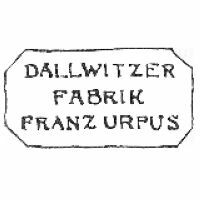 Used between 1860 and 1871, 'DALLWITZER FABRIK FRANZ URFUS'. 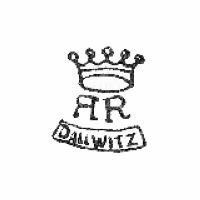 Used between 1871 and 1883, crowned 'R R' above 'DALLWITZ'. Used between 1875 and 1889, elaborate Riedel von Riedelstein mark in black. Used between 1875 and 1889, elaborate Riedel von Riedelstein mark, this time in black and gold. 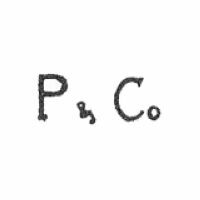 Used between 1891 and 1918, impressed 'P & CO.'. 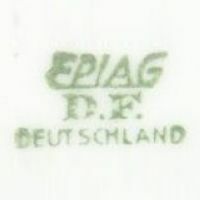 Used between 1918 and 1920, stating 'OEPIAG'. Also note the early 'Čecho-Slov.' country of origin designation. 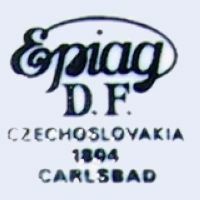 Used from 1920 onwards, stating 'EPIAG' (here also with the early 'Čecho-Slov.'). Script 'EPIAG' above 'D.F.' and 'CZECHOSLOVAKIA'. 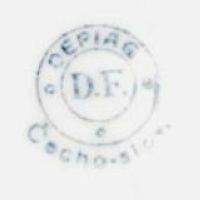 Note that this mark type is also found without country of origin. ... which is sometimes found as simple 'D.F.' above 'CZECHOSLOVAKIA'. Plain 'EPIAG' above 'D.F.' without country of origin. Used around 1940, an example used during German occupation. Note that it actually states 'DEUTSCHLAND' instead of 'GERMANY'. Used around 1940, during German occupation. This time with 'FREIHAND-MALEREI' and decorator mark 'MALEREI HAZI MÜNCHEN'. Used around 1940, during German occupation. Here a version which actually states 'GERMANY'. Used around 1945, script initials 'D.F.' above 'CZECHOSLOVAKIA'. 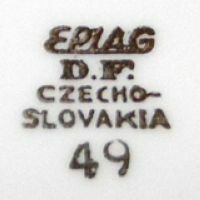 Used around 1946, 'EPIAG' above 'D.F.' and 'CZECHO-SLOVAKIA'. 'EPIAG' above 'D.F.' and 'PORCELAINE FINE DE BOHEME', without country of origin. 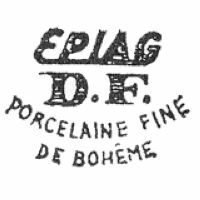 No exact dates known, 'PORCELAINE FINE DE BOHEME' around 'EPIAG' and 'D.F. ', all above 'CZECHOSLOVAKIA' and 'CARLSBAD'. No exact dates known, same as before but this time in green and with 'COBALT' addition. 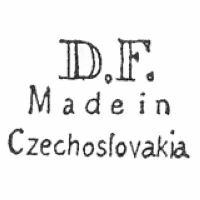 No exact dates known, similar basic mark with additional lines flanking 'CZECHOSLOVAKIA'. 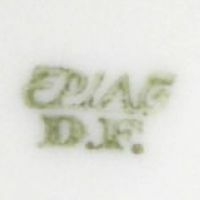 Used around 1990, script 'EPIAG' above 'D.F.' and 'CZECHOSLOVAKIA' above '1804' and 'CARLSBAD'. Used from 2002 onwards, the 'EPIAG LOFIDA' logo. 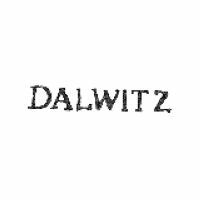 WARNING: Not a Dallwitz mark, as is sometimes claimed. 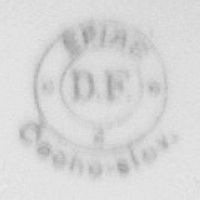 This is a mark used by DeFuisseaux Baudour from Belgium!